When Dictation Pro types incorrectly, use the command Correct that to correct the recently dictated word or a phrase. By giving the right word, you actually teach the program not to make the same mistakes again. This command opens a context menu that has at most nine alternatives to replace the incorrect word/phrase. Each alternative is numbered. Select the correct alternative by saying its corresponding number followed by OK. 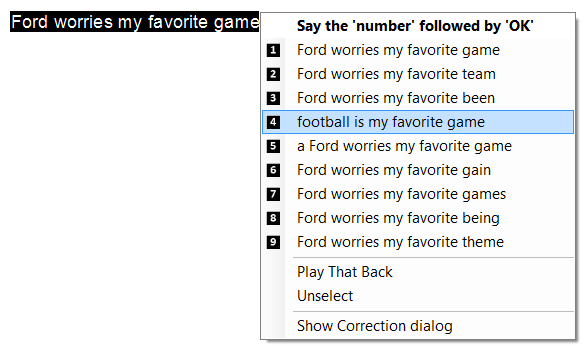 In the above example, "Ford worries my favorite game" is the phrase that is incorrectly recognized. On giving the voice command Correct that, a context menu appears. The fourth alternative is the correct one which has to appear in the document. 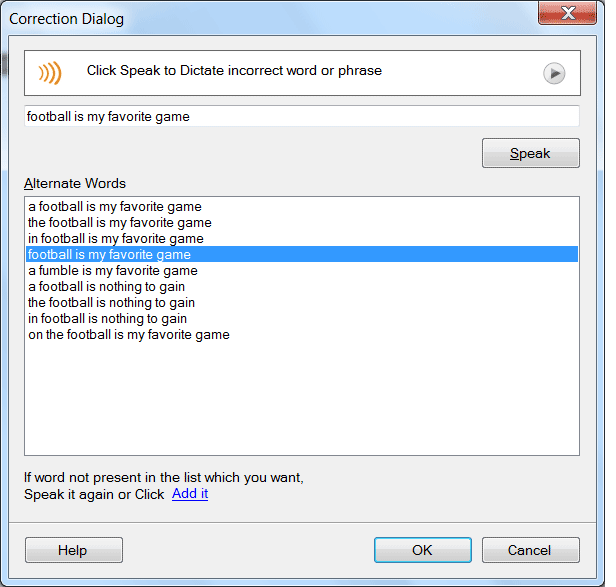 Say "four" followed by "OK" to choose the fourth alternative. Sometimes the text that is typed looks different from what you said. To make this correction easier, Dictation Pro records the way you actually dictated the text. You can play back your voice immediately after the text has been dictated so that you know what was said originally. If the word you want is not present in the context menu, you may open the correction dialog where you can train the word/phrase that was incorrectly recognized. Now, the next time you say the word/phrase, same error is less likely to happen again.